..... Balance Trading .....: Is Current Bear Market Rally Over? Fundamentally (Global Macro View): Economies worldwide are slowing down to no, or at best anemic, growth. Central banks have reduced interest rates to zero and sub zero to no avail. The amount of goods and services being produced is far exceeding the amount being consumed. The global consumer is either too old or too poor to consume all of that production. There seems to be no way out of this stagflation / deflation cycle. Politically: Donald Trump is going to be the likely nominee for the Republican Party. That brings a great deal of uncertainty to equity and bond markets. Markets hate uncertainty. When faced with so much uncertainty, there is only one way they go and that way is down. 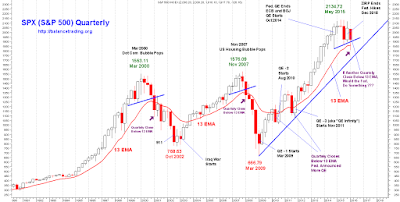 Technically: SPX reached its All Time High (ATH, 2134) on May 20, 2015 and since then SPX has lost 10% as of close of last Friday. 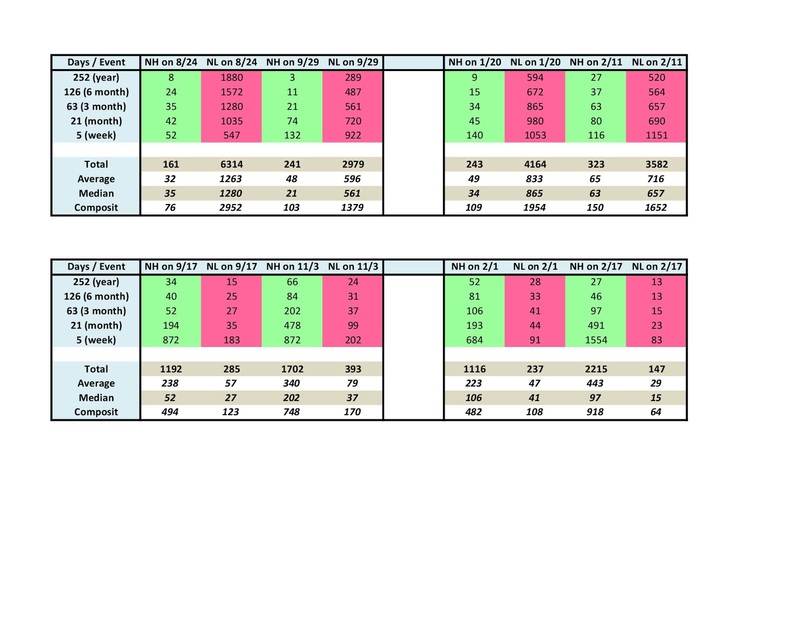 From late August 2015 to early February 2016, there were four bear market rallies and SPX gained an average of 10% during each of those rallies. Except for the rally from 9/29/2015 low (1871) to 11/3/2015 high (2116) the gain has been lower and lower for each rally. 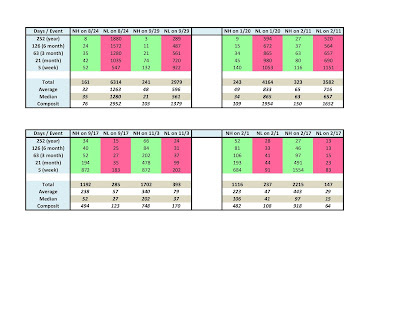 Furthermore, market internals and breadth deteriorated more during each rally. A study of the number of new highs (NH) versus the number of new lows (NL), summarized below, supports that the recent rally from 2/11/2016 low (1810) very likely ended at 2/17/2016 high (1930). 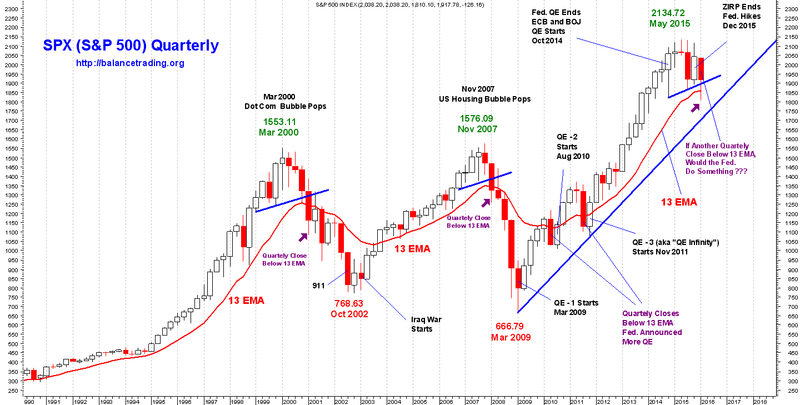 As shown on chart above, from 1990 to 2007 SPX traded below its 13 Q-EMA three times, Every time that happened the US economy entered into a recession 2 to 3 months later and SPX continued its sell off for at least another year. Those were recessions of 1991-1992, 2000-2002 and 2008-2009. From 2009 to 2015, SPX traded below its 13 Q-EMA twice, but both times the Fed intervened by starting more QE rounds (QE-2 in Aug 2010 and QE-3 in Nov 2011) which shored up indices and avoided a recession. The long term picture has not changed. 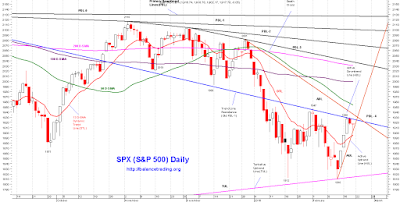 SPX penetrated its 13 Q-EMA and traded below it on Feb 12 by 3%. Chances are high now that the US economy enters or has already entered into a recession. Unless the Fed intervenes again and starts another round of QE, indices continue to suffer. Shorter term, chances are good that SPX continues to sell off. Once SPX starts trading below its AUL, then the likelihood of further sell off to retest of recent lows becomes high. Depending what price action is seen around 1830, I might cover all short positions or keep them open. 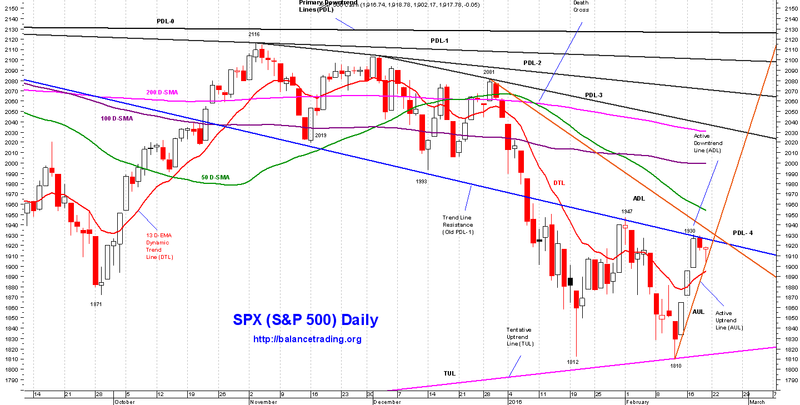 Should SPX sell off, take out 1810 and close below it, I would do my third and final short sell in SPY and QQQ. Last Friday I also opened my first of 10 positions (equal $) in UWTI.